With a capacity of 40,000 cans per hour, the filling line, placed into operation in 2009, is one of the biggest in the country. In fully automatic mode, aluminium beverage cans can be filled in the following sizes: 150ml, 200ml, 250ml, 330ml, 355ml and 500ml. We can offer still as well as carbonated beverages. Alcoholic drinks are also no problem for us. The filled cans can be packed into trays of 12 or 24 cans. In addition, we also offer 4 or 6 packs as well as customised printed trays with a volume of 150,000 cans per product and order. We only use natural mineral water for all products. 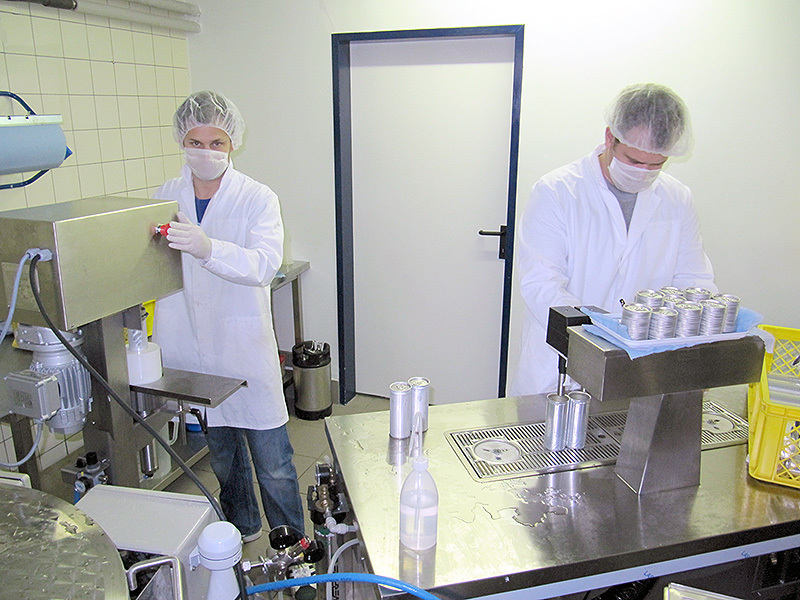 All cans are pasteurised after filling. Therefore, no chemical preservatives are required. The minimum quantity for filling customised recipes on this machine is at 50,000 cans per product and order. Here, your beverage is filled into neutral, unprinted cans which we label with high-quality shrink vinyl labels. You can find more info here. With an order quantity of at least 150,000 cans per design, we can print directly onto an aluminium can. 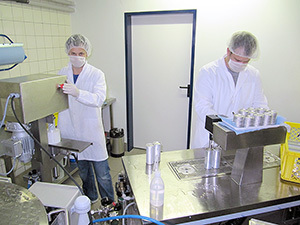 We can also fill counts of 1,000 and above especially for minimum product series and test fills. 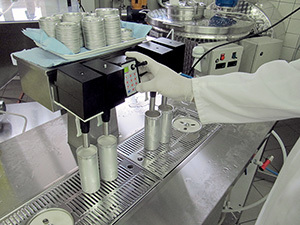 The cans are filled and seamed under laboratory conditions manually and then pasteurized in an especially developed machine. This possibility is particularly suitable for test fills and minimum production series.